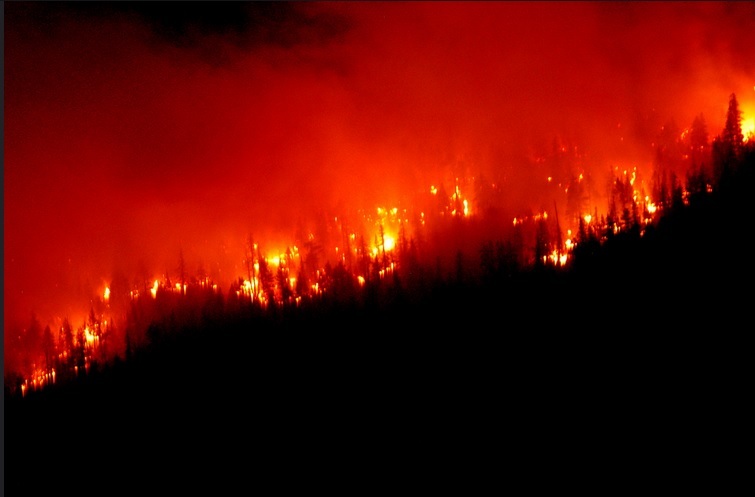 Sherwin Fire at Inyo National Forest in California. What does it take to pull together a coalition of diverse stakeholders to prevent wildfires from growing explosively in the western United States? Blue Forest Conservation (BFC) is listening to a broad range of views as it seeks to build traction for the Forest Resilience Bond (FRB) on the local, state and national levels to reduce wildfire intensity. The FRB will bring in private capital to fund ecological restoration to quiet wildfires in California and Colorado. It may expand to other states later. This collaboration is pioneering new ways to leverage financing and build partnerships. It is creating a model that other large-scale conservation projects may be able to imitate. This synergistic approach provides insights for the conservation finance field as a whole. Building a collaborative and diverse coalition is key to bringing private finance in to protect the West from wildfire damage. The coalition includes federal agencies, indigenous communities, academic researchers, social entrepreneurs, and legal firms. Developing new forms of contracting can help bypass some roadblocks that would otherwise hold back financing partnerships with the public sector. Bringing together the private sector and the public sector requires finding the strengths of each partner organization. The team is developing workarounds to streamline and simplify its collaboration with the Forest Service. This is because administrative delays can occur unless financiers are creative in setting up their partnership structures with that specific agency. “In utilizing cooperative agreements with the Forest Service, the implementation partner can actually take on the responsibility of letting the contracts on behalf of the Forest Service and managing the projects on the ground. This relieves the Forest Service of a significant burden and allows us to get funds deployed more quickly,” Knight said. When the Forest Service contracts out the implementation process, that removes roadblocks that might prevent financing from reaching its destination. From the Forest Service’s perspective, wildfire prevention continues to be a high priority. In 2015, the agency published the Wildfire Hazard Potential (WHP) map through Fire Modeling Institute to help inform evaluations of wildfire risk and support prioritization of fuels management needs across large landscapes. The MOU with BFC is the first step in a larger strategy for the Forest Service. This agency is working to create the conditions for public and private collaboration to address some of the most crucial issues it faces, like enhancing the health of watersheds and creating forests resilient to wildfire. “Making a substantial reduction in wildfire risk requires large-scale land treatment,” Herbert said. Madeira said she is enthusiastic about how private capital can create broad, powerful results for effective conservation outcomes. To make this large-scale conservation project happen, creating a diverse stakeholder coalition has been essential. Building these strong relationships through constructive discussions takes time and effort. This groundwork can then yield large-scale results that improve public health, economic growth, and environmental wellbeing. The Forest Resilience Bond website lists all of the partners involved in this multi-state effort. The development team includes BFC, World Resources Institute, and Encourage Capital. Two universities, forest collaboratives, and a federal agency are also involved – including the United States Forest Service. Academic partnerships with Stanford University and the University of California System are resulting in constructive collaboration with hydrologists, mappers, economists, modelers and scientists. Research on the results of the bond will show what the benefits, outcomes and challenges are. This controlled burn took place in northwest Georgia. When Knight and Madeira were in a graduate program at the Haas School of Business at University of California-Berkeley, they collaborated with two classmates to compete in the Kellogg-Morgan Stanley Sustainable Investing Challenge. Together, they pitched the idea for the FRB to finance wildfire prevention through environmental restoration in California and other states. Academic research showed the steps that needed to happen, but there was no financing tool in place to route private capital into this investment. Since then, they have developed the FRB and have met many stakeholders along the way. “We said, ‘Let’s take our lens and ask ourselves, ‘How do we go from recognizing the value that is created by doing this work to actually figuring out how to finance it?’’” Knight said. The FRB team plans to complete the restoration work within the first year or two of the project, Knight said. Evaluation will take place while the work is being completed. This will include metrics that will provide financial return to investors through both cost-share and performance-based contracts. The Forest Service, state agencies, and/or utilities will make cost-share payments. Utilities may also make performance-based payments. Building employment into the bond’s results is a goal that the FRB team said is important. This includes not just jobs in forest restoration, but also other positions in related fields. For example, local residents could use biomass for energy or manufacturing. Rural communities in the West where forest fires are occurring tend to have lower incomes and higher unemployment than neighboring areas, Knight said. Looking for local workers is part of the process of developing the implementation team. “Depending on project location, often there’s not enough folks available to implement these restoration projects. That’s a serious bottleneck but also an opportunity for job creation,” Knight said. Native Americans are among the potential hires whose jobs the FRB team may finance. Knight and Madeira said they see it as essential to listen to the forest collaboratives and other stakeholders when they reach out to them. Note: Natural Resources Conservation Service and the United States Forest Service are two funders of Conservation Finance Network.